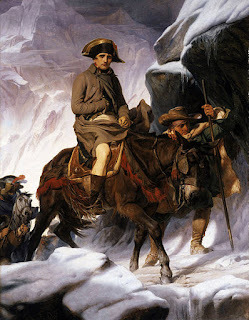 In 1800 Napoleon Bonaparte crossed the Great St Bernard Pass with his 40,000 strong army. A heroic feat which certainly appealed to the contemporary Romantic imagination of the time. 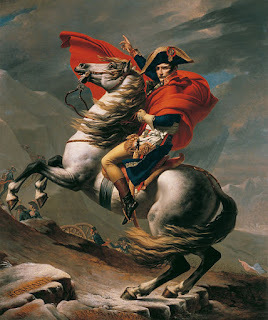 Like Hannibal and Charlemagne before him, he was a modern embodiment of ‘a superhuman power pitted against the supernatural terrain.’ The feat, and the man himself, were immortalised in Jacques-Louis David’s contemporary portrait – Napoleon on the St Bernard Pass. 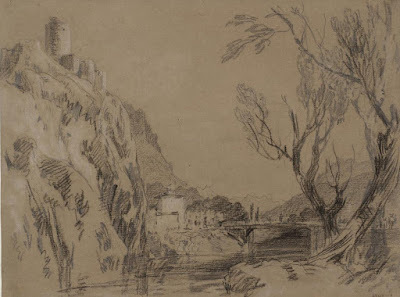 Yet only two years later, in 1802 – during the brief Peace of Amiens – a different painter actually made the same mountain crossing for himself. Only 27 years old at the time, but already at the top of his profession and widely regarded as the most outstanding British landscape painter of his generation, J.M.W. 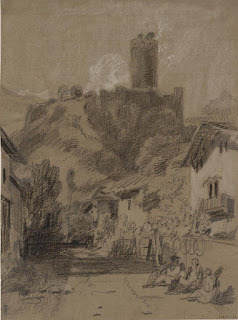 Turner was travelling on his first tour of continental Europe. 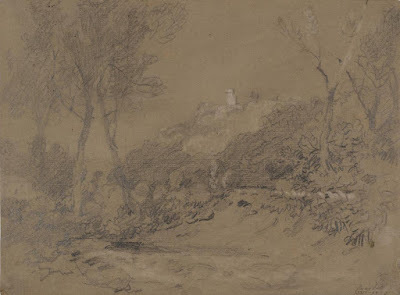 In later years, unlike his contemporary countryman, the landscape painter John Constable, who never left Britain at all, Turner became a frequent traveller in Europe. 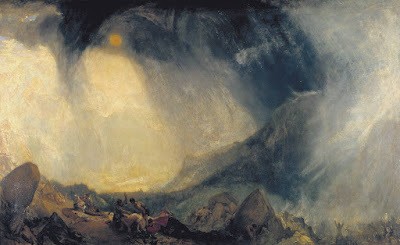 Despite a poor aptitude for foreign languages Turner’s confidence was ever undaunted. His first tour, travelling in style in the company of an aristocratic patron, must have set the pattern – even though subsequent trips were made alone and as cheaply as possible. 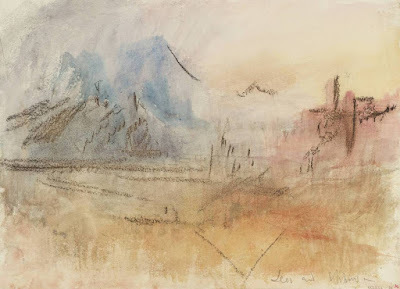 Turner’s unabashed adventurousness was perhaps matched only by his natural curiosity and his artistic acuity – the body of works he created whilst on this first Alpine tour is regarded by critics as peerless. I like this notion of the very ordinary Mr Turner as the leveller of tyrants. Deftly underlining the genuine measure of man against the reality of nature and the power of the elements, grounded in his deeper, practical understanding and his geographical knowledge of the locale. This is informed, and intellectually expressed, anti-propaganda of the subtlest order. That said, though, it’s interesting to note another painter, Paul Delaroche, whom I very much admire, was later commissioned to paint a more realistic scene depicting the crossing. This version, clearly echoing David’s, was not meant to be demeaning, however, as Delaroche apparently admired Napoleon. Last year I visited Martigny twice, in winter and in summer. It is a small town, which dates back to at least the Roman era (when it was known as Octodurus or Octodurum), tucked away in a steep sided valley a short distance from the far eastern end of Lake Geneva, not far from Mont Blanc – an ancient crossroads town with roads leading off to Italy and France, as well as other parts of Switzerland. I was working at the Fondation Pierre Gianadda, an art gallery whose grounds incorporate several Roman ruins amidst a fine collection of modern art sculptures. A little way down the road stands the remains of a very fine Roman amphitheatre. Overlooking the town is La Bâtiaz, a small fort with a high tower, which gives commanding views along the valley whose slopes are covered with terraces laced with carefully cultivated vines. The wines of the Valais region are, in my carefully considered (and equally savoured) opinion, one the best little known secrets of Europe. Martigny is very proud of its heritage – and certainly of its connections to famous artists such as Turner, plus poets and writers, like the Shelleys and Lord Byron, who all passed through here; perhaps unsurprisingly, though, less mention seems to be made of his nibs, ‘Old Bony’ – Napoleon Bonaparte. 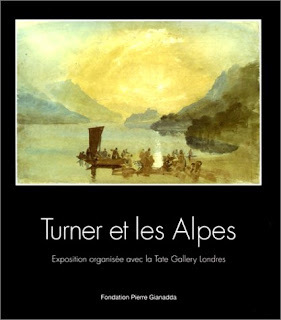 In 1999 the Fondation Pierre Gianadda, in collaboration with the Tate Gallery in Britain, hosted a wonderful exhibition, titled: Turner et les Alpes. 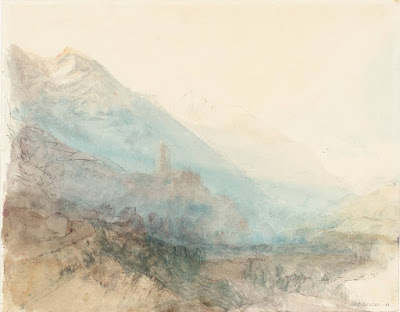 It was a real pleasure to leaf through the catalogue for this exhibition, and to compare it to the vistas which greeted you whilst walking around the town, almost as it were as if one was peering over Turner’s shoulder in some places – seeing him sketch out the scene in one of his sketchbooks, which were later worked up into finished watercolours – like a window into his past. All images of artworks, The Tate Gallery, London; except the two paintings of Napoleon, Wikimedia (click on images for more info). Photographs of Martigny by me, 2014. You might also like to read Alex Cochrane's article on Charles Dickens' visit to the Great Saint Bernard Hospice in 1846 - "Dickens: The Frozen Dead and a Macabre Swiss Mortuary"